NOTE: The Charging Adaptors' color is stochastic, will be white or black, which depends on the different shipping batch. 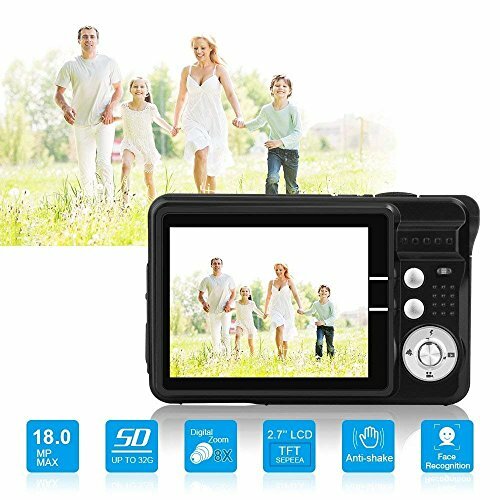 Features: 2.7" TFT LCD display with 8x digital zoom,Built in flash; 18MP resolution for good photos and HD 720P resolution for better recording. How To Get Clear Pictures: Please do not open Close-up while using or you will get blurry pictures,except for Marco view. Do not shake your hands until shutter is totally completed,Open Flash while light condition is not good! Product Message:Completed product checking before shipping to make sure all item works as advertised. With 30 days money back and one year warranty includes after-sale customer service. If you have any questions about this product by Yasolote, contact us by completing and submitting the form below. If you are looking for a specif part number, please include it with your message.